Normal coffee mugs won’t do when it comes to enjoying cappuccino coffee. Not only do they look crude holding such an elegant drink, they are also impractical. For one, they are too large. A cappuccino serving can be as small as 125ml, which is far too little to put in a 350ml coffee mug. Secondly, a normal coffee mug will cool the drink down too quickly. You need a cup that lets you savour your cappuccino in relaxed unhurried sips. 1 What is a Cappuccino Cup? What is a Cappuccino Cup? A cappuccino cup is designed specifically for cappuccinos. It has several qualities that differentiate it from a normal coffee cup. One, it’s much smaller. Cappuccino cup sizes range in size from 150ml to 250ml. Two, cappuccino cups are designed to provide extra thermal insulation. This prevents the drink from getting cold. China cappuccino cups tend to have a thicker bottom that prevents heat loss. Glass cappuccino cups are often double-walled. This keeps the drink hot while also making it easy to hold the glass without getting your fingers burnt. It also prevents condensation which can otherwise cause the exterior of the cup to get wet with condensed water. Cappuccino cups are great if you host guests often or you love brewing specialty coffee. They also make for thoughtful personal gifts to coffee lovers in your life. According to the Italian Espresso Institute, the standard size for a cappuccino cup should be between 150-160ml. Different countries will have their own varying standards. In the US and UK some cappuccino servings can be as big as 240ml (8oz). Different restaurants and cafes will also have varying servings but most use a 5-6oz cup (147ml-177ml). At home you have the freedom to choose whichever size you want. There are smaller cups that measure between 150ml and 180ml. You can also opt for larger cappuccino cups that start from 200ml to around 250ml. Check how well insulated the cup is. If it is made from china (porcelain or bone china), it should have a thick bottom that keeps the coffee hot. But double walled glass cappuccino cups are the best for insulation and they are also the most comfortable to hold. The shape mostly has to do with what kind of saucers you can use the cups with. If you are buying a set that comes with both the cups and saucers, then size is not a big deal. But if you are getting individual cups, it’s important to check whether they can fit the saucers you have on hand. Most cappuccino cups are made from either porcelain or ceramic. They are tough and don’t break easily. They are also dishwasher safe. More expensive cappuccino cups are made from clear borosilicate glass, usually double walled. Some people think they look more elegant because you can see the layers of espresso and milk inside the cup. All these materials are great. So it’s up to you to choose the one you prefer most. Cappuccino cups can still be elegant and stylish without handles. This pair of Delonghi thermos glasses is a perfect example. The cups are made from double walled glass which does a great job keeping your cappuccino steaming hot. It also does the double duty of preventing your fingers from getting burnt by the hot coffee. So even without handles, you can still hand out these glasses to guests without worrying about any injuries. But be careful. The cool-to-the-touch exterior might make you forget how hot the coffee is. Several customers have scalded their tongues that way. The double wall design also prevents condensation on the surface of the cup. These cups are made from borosilicate glass which is tough and durable. It is also dishwasher safe. The glasses have a 190ml capacity, meaning you can serve around 170-180ml of cappuccino in each. They are perfect whether you love enjoying cappuccinos at home or you are planning to host some guests. They also make for a beautiful gift to someone who loves coffee. The only minor downside with these glasses is that it can be hard to find the right saucers to pair them with. Excellent insulation thanks to the double walled design. Break-resistant and long lasting borosilicate glass. If you are looking for traditional porcelain cappuccino cups, this is a great set. The cups have the charming tapering style of traditional cappuccino cups with a wide mouth and a narrower base. Since they come with their own saucers, you don’t have to bother finding the right saucers to use with them. Each cup has a capacity of 5.5oz (163ml), which is within the recommended capacity range for cappuccino cups. They are great if you want to make proper Italian cappuccino. Both the cups and the saucers are made from tough high quality porcelain. They will withstand years of use and can withstand a moderate fall. They are also dishwasher safe. The porcelain keeps the coffee hot long enough for you to enjoy it slowly without worrying that it will get cold. Great option for hosting guests or enjoying cappuccino at home with the family. Tough and long lasting porcelain material. Perfect size for enjoying proper Italian-style cappuccino. If you don’t really care much about sticking to the traditional 5-6oz cappuccino capacity, you’ll love this set. It consists of 4 cups, each with a capacity of 210ml (7oz) which is a lot compared to Italian-style cappuccino cups. In fact, they are big enough that they can also double up as tea mugs. They are great if you want a bigger serving of cappuccino. 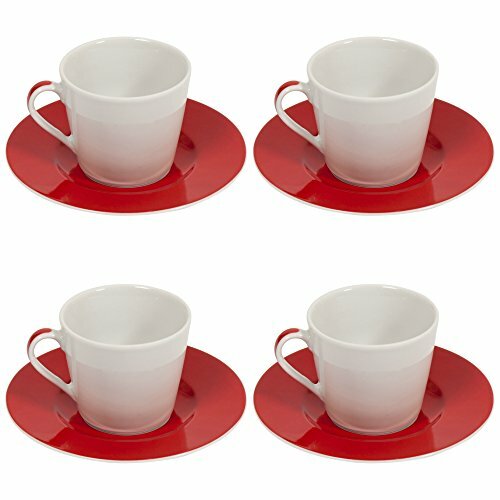 The cups come in a classic white styling which contrasts well with the red saucers. To match the red saucers, each handle on the cups has a bold red streak. A glossy finish adds to the elegant style of the cups. They make for a nice addition to any kitchen or office. Both the saucers and cups are made from ceramic, a tough and durable material that is also dishwasher safe. It insulates the coffee fairly well though not as efficiently as the double walled Delonghi glasses. Beautiful and well-made cappuccino cups. Great for serving guests, for use at home or as a gift to someone special. If you still want glass cappuccino cups but want yours with a handle, this set of 2 is perfect for you. Like the ones from Delonghi, these ones are also double walled. This has several benefits. It insulates your coffee, keeping it perfectly hot for a long period. You can sip the coffee unhurriedly without worrying it will get lukewarm or cold. It also insulates your fingers against the hot coffee. You (or your guests) can easily hold the cup without getting burnt. The glass used is borosilicate glass. It can withstand high temperatures and is resistant to breaking. It is also dishwasher safe. The glasses are big compared to traditional cappuccino cups. Each one is 225ml. They are a great choice if you prefer larger servings rather than the tiny servings of Italian-style cappuccino. I love the overall design of the cups. The curved style with the bulging middle looks beautiful and elegant. The small elegant handle adds to the style. This set is great if you love hosting or if you are looking for a gift to give to a coffee lover. Double-walled glass design provides excellent insulation. Tough and long lasting borosilicate glass. These elegant glasses also make use of a double wall to provide insulation, keep your fingers from getting burnt and prevent condensation. They are made from the same borosilicate glass as other double walled glasses. This makes them less likely to break and ensures they are safe in a dishwasher and microwave. Unlike the other glasses in our list, these ones come with saucers, metal saucers to be specific. The glass and metal pairing looks quite stylish and unique. Double walled design for insulation and safety.